As you’re reading this, I’m likely waving the spatula around my head, shouting these words, and spinning around the kitchen like a sword dancer. My husband, frightened, is backing away, grateful I’m not holding a chef knife. What could he have said that provoked this crazy dervish display? But I’ll give my behavior a second thought. After all, he always does the dishes. When he pulls out the vacuum cleaner, he’s probably thinking the hose could fend off an attack. Putting down my spatula, I’ll smile. We’ve got a lot of leftovers. I’ll go to the fridge, thankful I remembered to buy tortillas, clever packages for bundling Thanksgiving Day leftovers into burritos. The recipe I’m providing is merely a template. You may prefer using larger wheat tortillas, which are more commonly used when making burritos. 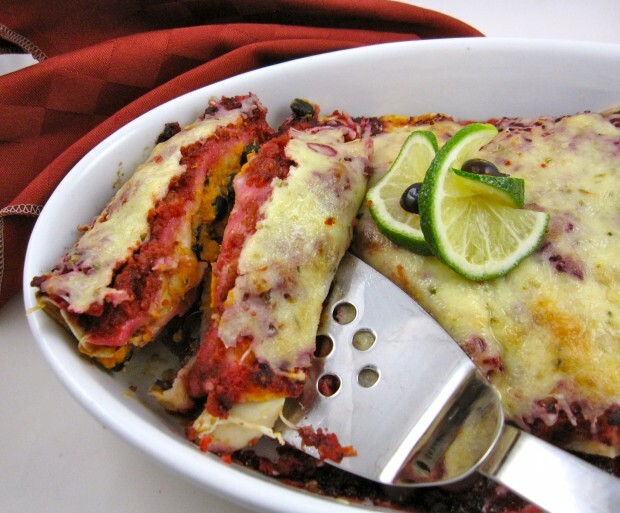 I used corn tortillas for mine; I enjoy the nutty and seedy flavors of corn paired with healthy sweet potatoes and cranberries. Additionally, you might have leftover gravy which could be poured over the finished burrito instead of the cranberry relish, yielding a lush and rich dish. Your burritos could be filled with green beans, corn pudding, ham or stuffing, all of which could be topped with Italian-styled cheese instead of the pepper jack I used — a Burrito a la Bologna, if you will. I have much to be thankful for over the holiday season. But right now, another Thanksgiving slogan comes to mind: I am thankful for leftovers. Combine salsa and cranberry relish. 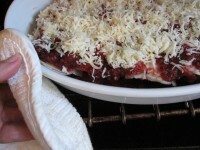 Pour 1 1/2 cup of salsa mixture into the bottom a lightly oiled baking dish, large enough to accommodate enchiladas. Place the torn turkey pieces into a bowl and toss with lime juice. Season to taste with kosher salt and freshly ground pepper. Combine sweet potatoes or squash with cumin and black beans. Add kosher salt to taste. In a sauté pan large enough to accommodate tortilla, heat 1 teaspoon oil. Cook one corn tortilla until softened, turning it once. Place the tortilla into the sauced dish. 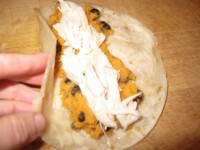 Spoon 3 tablespoons sweet potato-black bean mixture down center of tortilla. Sprinkle with turkey. Roll up the enchilada- seam side down, and place it at the far end of the dish. Repeat for the remaining tortillas, adding more oil, if needed to soften them. Pour the remaining salsa over the tortillas. Sprinkle with cheese. Bake on center rack of oven until enchiladas are bubbling and heated through, about 30 minutes.